Mushrooms stuffed with sausage, cheese and more mushrooms - a definite treat for mushroom lovers! Remove stems from mushrooms; set aside. Use melon baller to carefully scoop small amount of flesh from each mushroom cap; place, hollowed side up, on parchment-covered rimmed baking sheet. Finely chop removed flesh and stems. Remove sausage from casings; crumble into medium nonstick skillet. Cook on medium-high heat 5 min., stirring frequently. Add chopped mushrooms, dressing and thyme; mix well. Cook 5 min. or until tender. Add bread crumbs, onions and cheese to mushroom mixture in skillet; mix well. Use melon baller to portion filling into caps. 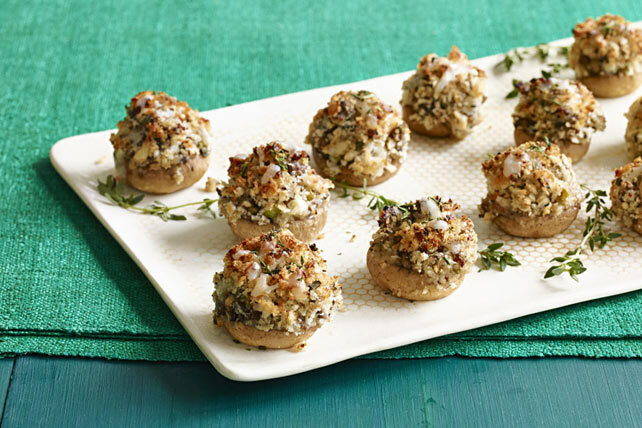 These delicious mushrooms can be stuffed in advance. Refrigerate up to 3 hours before baking as directed. For best results, use mushrooms that are about 2 inches in diameter. Garnish with chopped fresh thyme or sliced green onions just before serving.